First I would like to express a Happy New Year to all of my Jewish friends, including my brother and his family, my daughters, my cousins, aunts and uncles and let's not forget my parents, who reading ahead to the next paragraph, are now rolling over in their graves. I used to be Jewish. But I dropped some window pane acid while a student at Michigan and ever since, whenever I go to the Synagogue, ("Temple" for you heathens), everyone just stares at me. I think they are watching to see if I take any of those books stored on the back of seats into the bathroom with me. Geez, all it took was one time to discover that there are no photos in those books! What are they all staring at, anyway? Beleaguered and weary, from the abyss of the crash, a shrill cracking voice wonders aloud, "BOOYAH, Jim, have we suffered enough, or are there further horrors awaiting us in the treacherous days that lay ahead?" From up high comes a deep baritone reply: "Who knows what evil lurks in the heart of men?" 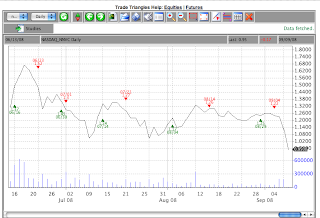 Let's use the Daily Triangles for an exit on this trade. 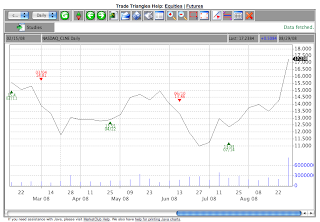 PS: I'll have a new tutorial on trading the Q posted at Market Club in the next few days. I'll alert all when it appears. As promised, here is Part II of Fireside Chats with Dr. Eugene Seymour, MD, CEO of NanoViricides. 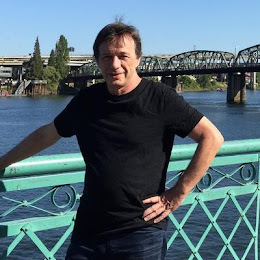 I want to thank Dr. Seymour for his open and candid responsiveness to my questions and his cooperation in getting this information out to the public through the auspices of this blog. Allan: Would you outline the Company’s priorities for the next 12-24 months and what will the competitive landscape be during that time? 1) Develop a small-scale prototype pilot production unit within our existing facility. The data from this unit will be given to our production partner to dramatically ramp up production capacity under GMP (good manufacturing practices) conditions (required for Phase II human efficacy trials but not for Phase I human safety trials). 2) Conclude at least one partnership deal for each of the drugs that we would initially like to take to market (this includes the veterinary). 3) Current thinking is that HIV, H5N1, H1N1, rabies and EKC/Herpes of the eye in humans and animals (cats, dogs and horses) will be our initial major focus although this may change depending on the demands of the market. In my estimation, HIV, H1N1 and the eye markets in total are billion dollar plus markets while the rabies drug market is in the range of $300-$500M. We are aware of no other company operating in the anti-viral field that has the ability to destroy the target virus. Our technology is the result of 15 years of development done by Dr. Diwan. While H5N1 (Influenza A) has faded from the public consciousness, the virus or its successor mutations continue to represent a threat. An article from the Cornell University newspaper summarizes the current situation. While the article states that no vaccine will work and no one will be immune, it fails to mention that the current treatments will be largely ineffective for two reasons. First, the virus rapidly develops resistance to the drug and secondly, since the virus continues to rapidly mutate, the drugs lose their effectiveness. We do not expect either of these two factors to be operative with our compounds because if the virus mutates away from the attachment mechanism, it also will lose the ability to attach to a cell, thereby rendering the virus ineffective. Essentially, we are currently completely unprotected against the risk of a pandemic. Allan: What do you say to shareholders who see all the potential of the Company and the prospects for the application of the Company’s products globally but who seek immediate returns on their investment? I would ask them to look carefully at their overall investment strategy and consider the risk/reward profile of biotech investing. Biotech investing is not for the faint of heart. I feel that we have a large group of committed investors who are holding their stock, awaiting the consummation of a major event. I will do everything I can to not disappoint them. Lastly, a word about the studies. I quite frequently get asked why studies take so long to both start and end. Most people don’t realize that the time from the signing of the initial contracts to the actual start of the study can range anywhere from 3 months to 12 months. A notable exception was the HIV study done earlier this year in Boston. In that instance, we had started on the contractual talks months before we even planned to begin. When I saw that the second HIV vaccine trial had failed, I asked our researcher how soon he could start. From the time we gave him the go-ahead to the time he started was 72 hours. This was because the virus was on hand, the BSL-3 laboratory was available, research animals were available, he was able to pull together staff quite quickly and all the contracts had been signed and the committee approvals were in hand. Fortunately, all of the initial legwork had been done! In my mind the HIV results reported over the summer were extremely significant. We have met with the government agency that’s intimately involved with HIV. We are working with them to redesign the protocol for a repeat study that looks more carefully at both virus in the circulation as well as residual virus hidden within the immune system cells. There were some very interesting findings in those areas that must be confirmed before being reported. Our plan is to have the new protocol designed by the end of October. This timetable is predicated upon coordinating the schedules of at least five different scientists, both in our Company and at the government agency. The repeat HIV study should then start after that. The veterinary market appears to be a potential source of more immediate commercial income. Herpetic keratitis, a herpes infection of the eye in animals is thought to be a very large market. The barriers to entry are much lower than those of the human market. Look at this website of the FDA. We are now investigating what additional safety studies are necessary in order to apply for “conditional approval” in the animal anti-keratitis eye drug market. If this approval is received, we then have 5 years to prove efficacy. As I sit here watching Democrats and Republicans fumble-snipe at each others heels while the world awaits a resolution of the proposed $700B infusion to stall-off Armageddon, I am reminded of the 1960's television series, "The Twilight Zone." Can this really be happening? Is the fate of mankind riding on Barney Frank? While attending law school in Boston in the mid-1970's, a group of us law students from Suffolk, BU and BC used to gather Sunday mornings on a ballfield on Comm Ave for pick-up softball games. A rolly-polly brother of one of our regulars, Barney Frank was then a struggling state representative that couldn't field nor hit, but our object wasn't to qualify for the Olympics, but to assemble enough bodies to field two teams, so Barney, gay as he might have been, was as welcome as any of us. To think that Western Civilization now rests in his chubby-clumsy little hands, gives your author great pause. Oh my, oh my, oh my. The image of Henry Paulson and Ben Bernanke squirming and begging before Congressional committees, of seven minutes of glory per pandering politician to squeeze contrition out of these two pillars of capitalism, enough to make a grown man vomit, followed by the follies of Kudlow, Cramer, & CNBC knick-knacks chillin' and spillin' their guts out of their new found celebrity, all the while pumpin' and dumpin' to stay tuned for the next segment where the world may end, or be saved, or some combination thereof, television docu-drama at its finest and at it's worse, all at once, oh my, oh my, oh my. What to do with all of this hubris, the suits on high horses, the calvary of great expectations charging across the valley of the doomed investors, bugles blowing and flags a waving as limousines pull up with Obama and McCain engaged in a two-step in center ring, while donkeys and elephants jump through rings on fire; this is what we have come to see, the circus is in town and we gather beneath the tents, it's going to be a humdinger of a show, oh my, oh my, oh my. This video was put together my the Market Club folks and it gives a bullish analysis for Gold going out the next six months. I have been asked by several readers what I am doing as a result of the proposed bail-out provisions being bantered about by the powers that be. Mine is a multi-faceted approach specifically designed for my best interests, just like Goldman Sachs. First, I have petitioned the SEC to add my name to the No-Short List. Although I have no shares, I just don't want to be hassled by anyone and I figure getting put on the list will scare away any detractors. Second, I've asked the Fed to take over all my credit card debt, which in retrospect was a mistake, as well as to reverse or assume any of my trades taken in 2007-2008 that resulted in capital losses. Certainly my losses in these transactions are something better suited for the Fed's balance sheet then my own. Furthermore, all that credit card debt is hampering my ability to buy high ticket items on credit and if I was relieved from such a burden I could resume my vigorous contribution to a strong and expanding US economy. Now these steps may or may not be beneficial to any one individual, so I suggest you consult with your own personal adviser, or Suze Orman, before attempting any of these strategies on your own. 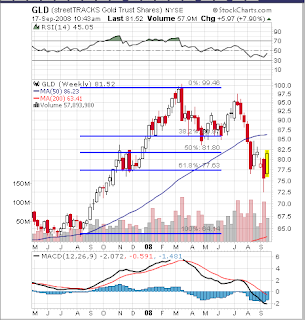 I'm buying Gold today, specifically calls on the Gold ETF, symbol GLD. Here are a couple of charts supporting this position. As for fundamentals, Russia is imploding, Financial markets are imploding, while uncertainty and risk are exploding. These are the kind of developments that Gold feeds upon and evidenced by today's $50 plus move in gold. 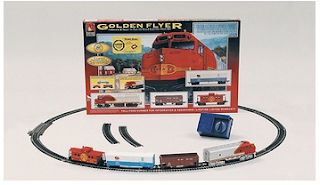 The Golden Flyer Express is about to leave the station. What If The Worst is Yet to Come? "We are nowhere near the resolution of a financial crisis that has been years in the making and that has only begun to have its impact on a newly globalized economy." Rather then piece meal the author's ideas with my own, here is the column in it's entirety, posted in the spirit of I couldn't have said it better myself (or, in the spirit of laziness on a Sunday afternoon). Oil prices have now dipped back near $100, other commodity prices are in a free fall, interest rates are down, and the dollar is up smartly against just about every currency. From one angle, that all looks to be good news. Since food, energy and commodities were behind the recent surge in prices, inflation suddenly looks like less of a threat, particularly since a strong dollar also lowers the prices of other imports. Lower energy prices take some of the pressure off such hard-hit industries as autos and airlines, and off households that have been forced to cut back on other expenditures. More growth, less inflation -- nothing to complain about there. But what if it weren't that simple? What if what's really happening is that sky-high energy and commodity prices weren't a reflection of a fundamental shift in supply and demand, but merely another speculative investment bubble? And what if that bubble burst because the investment herd finally realized that double-digit annual economic growth in developing countries was not a sure thing -- that it was actually unsustainable, the result of underpriced currencies and an investment boom that had created bubbles in asset prices and economic output? That, of course, would be a very different story. It would explain why prices for just about every financial asset you can think of are now falling all around the world, sending desperate investors fleeing to the apparent safety of U.S. Treasury bonds and the U.S. dollar. It would explain why the slowdown in the United States had spread to other once-bubbly economies such as Spain, Ireland and Britain, to commodity-dependent economies such as Russia, Canada and much of the Middle East, and to export-dependent economies such as Germany, China, India, Vietnam and South Korea. And it would explain why the financial turmoil that began on Wall Street had finally gone global. To put the question slightly differently: Are we witnessing an overdue unwinding of economic imbalances and market excesses, or are the markets and the global economy now caught in a vicious cycle of panic selling and de-leveraging that has begun to spin out of control and threatens to take the global economy down with it? I'd love to be the optimist on this one, but with each passing day it feels more like global contagion. Here at home, the government has taken extraordinary steps to rescue failing institutions, while governments abroad have begun to move aggressively to prop up their falling currencies. Money is rushing out of developing markets at a rate not seen in a decade, driving down major stock indexes 30, 40, even 50 percent on the year. For the first time in years, auto sales were down last month in China, while Infosys Technologies, India's outsourcing giant, warned investors of disappointing sales growth. And what does it tell you that, among major economies, the lone bright spot is Brazil? It's also hard to be an optimist when the United States continues to report near-record monthly trade deficits and when its government is on a path toward a $500 billion budget deficit next year. Lower oil prices should quickly help to bring down both deficits, but a rising dollar and slower export growth are pushing things in the opposite direction. On financial markets, meanwhile, you have near-record spreads between interest rates on risky bonds and loans and those on U.S. Treasuries. You also have wild hour-to-hour and day-to-day swings in the price of financial assets in response to the latest rumors about hedge fund losses or any shred of news about WaMu or AIG. Want to finance a shopping center or corporate takeover, float a junk bond or new stock issue, or securitize some vanilla-variety college loans? Forget it. As one market-savvy economist told me yesterday, "We've been at this for more than a year already and it's not getting any better. People still don't understand what is happening." The next chapter in this saga is expected to be written over the weekend with the government-orchestrated takeover of Lehman Brothers, the latest financial institution to get trampled by the retreating herd. But it's unlikely Lehman will be the last to get hit. We are nowhere near the resolution of a financial crisis that has been years in the making and that has only begun to have its impact on a newly globalized economy. "The investment seeks daily investment results, before fees and expenses, which correspond to twice the inverse of the daily performance of the NASDAQ-100 index. The fund normally invests 80% of assets in financial instruments with economic characteristics that should be inverse to those of the index. It may employ leveraged investment techniques in seeking its investment objective. The fund is nondiversified." As you can see, the Triangles are undefeated this year, averaging 11.78% per trade for a total year-to-date return of 61.27%, versus a buy and hold return of about 15%. So why am I repeatedly referring to the Triangles? It's a simple trading system that anyone can implement on their own, clearly objective, mechanical, and effective. It's one of the few commercial products I support, despite a lot of other offers from other services to accept their advertising on my blog (outside of Google's standard click-ads). As for this particular example, the QID, it's no coincidence that I am highlighting today. 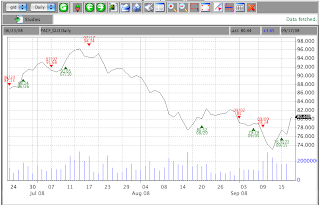 About one month ago I introduced a simple breakout trading system for NNVC. Here is a follow-up bringing the signals up to date along with some observations. You can always click these charts to enlarge them. Note how NNVC has been on a Sell, so if you were trading this method you would have missed or been short today's decline. The bad news is that if you are ever out of or short NNVC and they make a big splash on CNBC, you were penny wise but pound foolish. The flip side of that is there is always a 50% chance of being Long when the big news is made, or that the big news will just be one in a series of mega announcements. 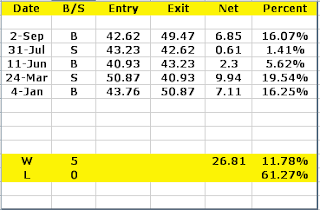 This is a continuation of the trading table from early August. A few observations: Trading the triangle signals Long and Short netted a return of 298% for the five months of signals. 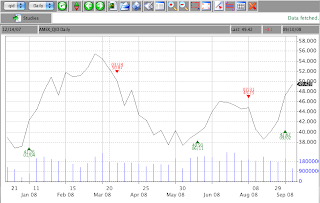 Trading only the Long signals and being flat the Sells returned 175%. Buying and Holding NNVC during the five months returned 75%. Finally, you don't have to trade your entire position, especially since there is a pretty good chance of blockbuster news coming at any time. But even trading just half your position using Market Club Triangle Signals may be a fun idea to sharpen trading skills, increasing NNVC returns while waiting to become rich and keeping this stock on your front burner, something I highly recommend. NNVC has fallen just short of 20% today and many of you have written me asking for my take. Longer term, everything is fine and NNVC can drop to the 50 week MA which coincidentally is channel support, all around 80-85c. Shorter term there was a Triangle Sell on the Daily chart at $1.22 on September 4th. Unless you are trading in and out of NNVC, this decline should be ignored, expecting 80c to hold, if it gets there, and the entire decline to eventually be retraced. NNVC, with it's small market cap and low liquidity is an easy stock to take down by a few decently capitalized short-sellers. On one of these decline-events, the Company could make an announcement that will take the stock up 100% or more, wiping out the short-sellers that have plagued NNVC for so long. We now know enough about the Company to render such an announcement to a question of when, not if. 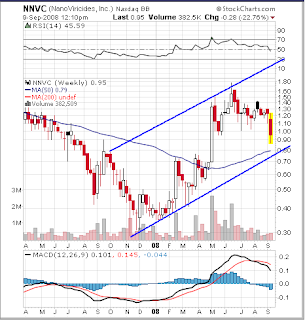 I'm a Buyer of NNVC under $1.00. The price of oil fell again on Friday, with spot prices closing under $110. Has oil's multi-year bull market begun to crumble, or is this just a mild pullback in an ongoing rising trend in the price of oil which has many more years and dollars per barrel to go? The link below will take you to a 17-minute crash course on, "Peak Oil, When Demand Exceeds Supply." It will outline in layman terms where the price of oil is in relation to where it has been and where it is going. It provides the fundamental story that along with technical analysis will provide the framework for trading oil, through ETF's, stocks and futures, going forward. Accordingly, it will do the same for Alternative Energy, Solar, Nuclear, Natural Gas, Wind and Biofuels. Consider this required watching for all readers and lurkers of AllAllan. PEAK OIL, When Demand Exceeds Supply. This is the first in a series of "Fireside Chats" with Dr. Eugene Seymour, Chief Executive Officer of NanoViricides. A few weeks ago I emailed Dr. Seymour with several questions about the Company and the state of it's business model. In his reply, Dr. Seymour suggested that I publish his answers in a series of, "Fireside Chats," so as to make this information more readily available to not only my readership, but to all other shareholders of the Company. NNVC is a company that I have been writing about since August, 2005. At that time, NanoViricides was truly a developmental stage company, it's common stock selling at about 10c a share. We have watched it grow, like a proud parent, past milestone after milestone with it's share price similarly growing-up with the Company. Today, with it's share price up over 1,000% in three years, it's time to take another look at NNVC to find out where it is in it's quest to become a global biotechnology force against some of the most deadly biological threats to mankind. What follows is a series of Q&A sessions between Dr. Seymour and myself, fireside chats focusing on the Company and what the future may hold in terms of corporate growth, contributions to modern medicine and bottom line benefits flowing through to the Company's shareholders. NanoViricides, Inc. (www.nanoviricides.com) (the “Company”) is a development stage company that is creating special purpose nanomaterials for viral therapy. The Company's novel nanoviricide™ class of drug candidates are designed to specifically attack enveloped virus particles and to dismantle them. The Company is developing drugs against a number of viral diseases including H5N1 bird flu, seasonal influenza, HIV, EKC (epidemic kerato-conjunctivitis or severe pink eye disease), hepatitis C, rabies, dengue fever, and Ebola virus, among others. This interview contains forward-looking statements that reflect the Company's current expectations regarding future events. Forward-looking statements involve risks and uncertainties. Actual events could differ materially and substantially from those projected herein and depend on a number of factors. Certain statements in this release, and other written or oral statements made by NanoViricides, Inc. are “forward-looking statements” within the meaning of Section 27A of the Securities Act of 1933 and Section 21E of the Securities Exchange Act of 1934. These forward looking statements are subject to known and unknown risks, uncertainties and other factors that may cause actual results, performance, or achievements of the company to be different from those expressed or implied including the success of the Company's research and development efforts, the availability of adequate financing, the successful and timely completion of clinical studies and the uncertainties related to the regulatory process, described in the “Management’s Discussion and Analysis” section of the Company’s Form 10-KSB and other reports and filings with the Securities and Exchange Commission. Allan: Can you give us a short history and overview of NanoViricides, Inc? Dr. Seymour: The Company was founded in mid-2005 by Dr. Anil Diwan, Dr. Eugene Seymour and the former CFO of the Company as NanoViricide, Inc. (“NVI”). NVI then acquired and merged into a Pink Sheet shell, Edot-com.com, Inc., changed its name to NanoViricides, Inc. and its stock symbol to “NNVC”. Following the effectiveness of the Company’s registration, since June 29, 2007 the Company’s Common Stock has been quoted on the Bulletin Board under the symbol NNVC.OB. When and if the Company meets one or more of the filing requirements for the NASDAQ National Market, the Company anticipates applying for a listing on that market. Those requirements can be found on NASDAQ’s website. Allan: Would you comment on the pathway from the lab to approval of a drug for use by the public? Dr. Seymour: This is a very complex question. In general, a company requests a “pre-IND” meeting with the Food and Drug Administration (“FDA”) to receive guidance as to what specific pre-clinical studies will be necessary. Following this meeting, toxicology as well as the pharmacokinetic and dynamic studies of the drug are performed. When completed, a dossier is prepared and filed with the FDA. If there are no objections, human Phase I safety studies can then start. This is a study where a number of healthy volunteers are given the drug and various physiological parameters are measured. Next is a small Phase IIa efficacy study, followed by an expanded Phase IIb, and then a Phase III efficacy study. Hopefully, the drug can then be approved for sale. In case of drugs for the treatment of chronic diseases, such as various cancers, the studies can last for years. In cases of infectious diseases with a limited time course, the process can be much quicker. In diseases such as rabies or Ebola, where it would be unethical to withhold potentially effective treatments, studies in animals may be substituted for human efficacy studies. This is at the discretion of the FDA. There are also “orphan diseases” or “rare diseases” where there are generally less than 200,000 cases in the US per year. There are thought to exist between 5,000-8,000 distinct “rare or orphan diseases”. There are certain advantages to developing treatments for viral “orphan diseases” which include extended patent protection and certain tax credits. In addition, approval time has historically been considerably shorter for drugs designated as “orphan drugs”. Although the FDA pathway appears to be an all or nothing proposition in terms of money, for biotech companies that license their drugs to large pharmaceutical companies, there are a number of revenue-producing events that occur during the FDA process. Typically, a biotech company may receive an upfront licensing payment, then milestone payments as the drugs moves through the process, followed by royalty payments once sales of the drug commence. In certain cases, the large pharma may even fund the clinical trials. We plan to license each nanoviricide optimized for a different disease to one or more pharma companies. This may allow for a constant income stream from each of the various licensed compounds during the approval process. Within the next 12 months, the Company anticipates having 2 sets of animal studies performed for at least 10 different diseases. If we are successful in that endeavor, we will attempt to license each and every candidate to a large pharmaceutical company. Allan: Is NanoViricides pursuing strategic partnerships and collaborations with other pharmaceutical companies? Dr. Seymour: As announced previously , we have an expression of interest from a number of large pharmaceutical companies. We have exchanged, though not signed, documents with one such company. One company, a New York Stock Exchange listed Chinese pharmaceutical company, has inquired into licensing the Company’s entire platform for the Chinese market. The Company has rejected such interests because of inadequate intellectual property protection rights in China. A company in Japan has requested world-wide rights to our anti-viral eye drug EkcCide. Five of these pharmas are interested in EkcCide and one in the HIV drug, HIVCide-I. Allan: How does the balance sheet and burn rate look to you in terms of accomplishing your goals? Dr. Seymour: We have spent approximately $2M/year for the past 3 years. Considering the number of candidates the Company has in the pipeline, we believe that this low level of expenditure is amazing. The Company just consummated a raise of $3M from previous, individual investors. We will continue to be careful with our spending to conserve as much of that investment and make it last as long as possible. What’s more interesting is the financing we have rejected as “toxic” to the Company. This would not have been fair to all the investors who have made it possible for us to get this far. In addition, we continue to seek funding to complete our prototype pilot manufacturing plant ($3M) and our toxicology/pharmacokinetic/dynamic studies ($3M) from one or more collaborations with one or more large pharmaceutical companies. Back on July 9th I suggested CLNE as a bet on Boone Pickens and his budding media onslaught promoting his alternative energy plan. At the time of that post, CLNE was trading at $12.75. 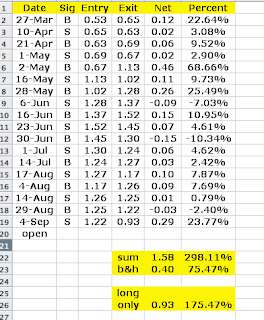 As of last Friday's close, CLNE is trading at $17.25, a gain of $4.50, or 35% in about 35 trading days, 1% per day, 20% per month and 240% annualized. That is the power of confirmatory analysis, triangles trading, chart analysis or any combination thereof. As a business decision, you can afford multiple 3-5% losses on other trading ideas and still come out ahead on one big winner. Did you get it? Let me repeat, you don't have to win on every trade as long as you take every trade, because if your underlying system is just 50% accurate, a toss of a coin accuracy, as long as you cut your losses and let profits run, you too can trade for a living. What about CLNE now? The fundamental story is still intact, only more so. 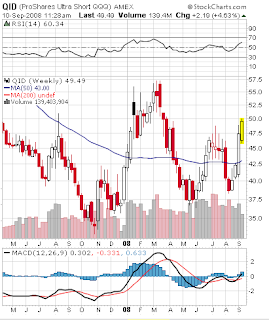 Pickens' Plan is gaining traction and the price action behind CLNE is adding credibility to the story. 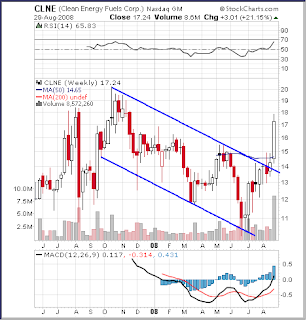 The Weekly CLNE chart looks great, with some resistance up around $20, about 20% above current prices. The Daily chart reveals a clear breakout above two longer-term trend lines. But look at the volume bars at the bottom right of this chart. Huge buying volume coming in last week. This is good, no? Well, the Triangles think so. By their very nature, the trade triangles catch every big move and it usually pays to be on the same side of the trade as the triangles. Ask yourself this: How many times in your investing life would you have gotten filthy rich if only you bought strength in a stock with a great story behind it? Amgen, Genenetech, Microsoft, Qualcomm, Rambus, Research in Motion, Nanoviricides, Google, Apple, shall I go on? I am not suggesting that CLNE is going up 2,000% from here, although it might. Only that everything that looked good about this stock in early July looks as good if not better now. If you want to wait for a new name, you know that one will get posted here sooner rather then later (ask yourself: what does he know that he's not telling us?). That's not to say CLNE won't outperform anything else that gets posted here, or posted anywhere else in the coming week. It's never easy, but more often then not, it's very rewarding.